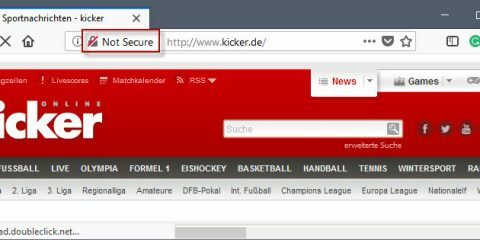 Opera Software released a new version of the Opera Developer web browser that incorporates some of the upcoming Opera R3, or Reborn 3, changes. The company put up a teaser on a webpage on the official Opera website recently that simply stated that a new standard would be coming soon to Opera. The first two waves of Opera Reborn introduced interface changes and other changes to the browser. Opera Reborn 3, R3, is no exception to the rule. Opera Software incorporated design changes in the latest Opera Developer version that are part of R3; these design changes will come to Beta and Stable versions of the web browser eventually. Opera calls the first stable version of R3 the first Web 3-ready desktop browser, whatever that means. One of the major design changes that R3 offers is that Opera tried to put the focus on the web content by putting it “center stage”. Opera R3 comes with a light and dark theme that are optimized for that; Opera engineers removed dividing lines and other distractions in the UI. The design was inspired by “high-key and low-key lighting photography” — two systems to maximize or minimize the light in photos — according to Opera. With the light theme, your entire browser, including the sidebar and tab area, is bright and clean. To us, this evokes a feeling of openness and optimism. We designed it to spark productivity and lift your mood. The active tabs received a bit of love as well in R3. Opera designed it so that it looks as if it “feels physically open and stay on tops of other tabs”. Users of Opera may notice that some items have moved. Opera moved EasySetup and Snapshot to the access bar. The access bar is located on the rightmost side of the address bar in the browser UI. There you find icons to access the snapshot functionality or Easy Setup. Snapshot gives you options to capture screenshots, Easy Setup direct access to often used browser preferences and settings. Opera Software has yet to reveal anything about non-design related R3 changes. It is likely that the company will publish additional blog posts when they are incorporated in the developer edition. I like the refreshed themes and how they look; ran into an issue with the titlebar not changing color on Windows 10; a restart of the browser fixed that issue however. Opera Software tries to innovate when it comes to functionality; the company introduced a crypto wallet in Opera recently. I’d like the company to address some usability issues and underlying issues in Opera, however, as well. Now You: what is your take on the new design? Ghacks needs you. You can find out how to support us here or support the site directly by becoming a Patreon. Thank you for being a Ghacks reader. 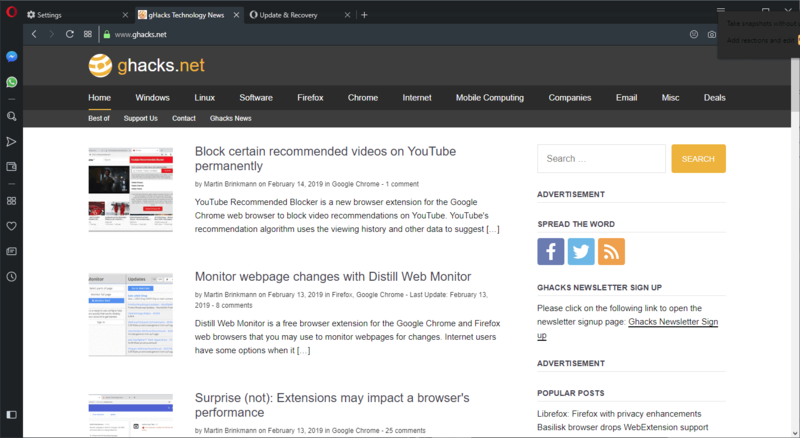 The post Opera reveals R3 design changes in latest Opera Developer browser appeared first on gHacks Technology News.